We are manufacturer of Cement Silo Storage. The Cement Silo Storage, conveying system manufactured by us is designed and developed using advanced technology. In compliance with set international standards, these systems are durable in performance, reliable and trouble free in operations and require negligible maintenance. The efficient system is also customized as specified by the customer. 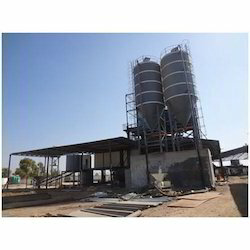 In order to cater to the requirements of construction, engineering and process industries, we have come up with an exclusive range of Cement, Flyash, Limestone Silos that is manufactured from very high quality Structural raw material make of suppliers Storage of Cement, Flyash, Limestone silos. These silos are manufactured in customized specifications as per our client needs and requirements. Looking for Cement Silo Storage ?